Q: Why isn’t my promo code working online? 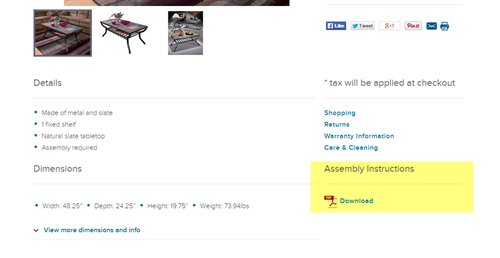 Q: Can I visit Hauslife Furniture to see the product before purchasing online? To find out if a store has the item you want, call or visit the Hauslife Furniture near you. Click here for Store Locations. Every store has a unique selection and may or may not have the item on display, please call first. Hauslife Furniture retail furniture stores are independently owned and operated. Please contact Customer Service at your local store. Click here for Store Locator for the exact locations. For most products, we do offer replacement parts. Call Customer Care at 866-436-3393, Monday through Friday, 7 a.m. to 7 p.m. (CT) & Saturday, 7 a.m. to 5:30 p.m. (CT). When inquiring, please have item number and invoice number available so they can better serve you. You can find the item number on your emailed order confirmation or invoice. Q: Are fabric swatches available? Visit your local Hauslife Furnituree to see fabric in more detail. Since every store carries a unique selection, we recommend calling the store to see if they carry the product you would like to see. Q: How do I touch up my furniture? Or you may contact us for a copy; please include the following information: your name and your email address or mailing address and the item number(s) you need to assemble. You may also, call Customer Care at 866-436-3393. Q: Does make custom orders? With more than 6000 items in our product line, we offer one of the largest selections of home furnishings available. In order to maintain high quality products at affordable prices, we choose to produce our furniture in large quantities, realizing cost savings, rather than making custom orders. You may view our online catalog at http://one.intlhomestore.com/ or find the Hauslife Furniture nearest you. Q: Can I file a warranty claim online? Click here to process a warranty claim. Q: What can I do if I have moved or my Hauslife Furniture is no longer in business? Chances are there’s a Hauslife Furniture near you. Click here for the store locator. If you need to file a warranty claim with us, click here. Please note: your warranty is no longer valid if you moved from the original place of delivery. Please contact us and include the full name and email address you want to have removed. Many carry the most up-to-date catalog. In addition, you can view the catalog online. Not at this time. But good news: many products are available for purchase online. Click the Shop Now section on our home page to begin shopping. Our products may be also be purchased from retail stores throughout the country. Click for the Store Locator. Q: What are USD and CAD? Q: Where can I apply for a job at Hauslife Furniture? We’re growing and always looking for professional, motivated employees. Click here for Careers. Q: Does Hauslife Furniture employ accounts receivables people who work from home or over the Internet? No, we do not have accounts receivable employees who work from home or process payments via the Internet. Hauslife Furniture invoices clearly state where payments are to be sent. Q: Does Hauslife Furniture charge a job application fee? Are you looking for a great place to build your career? We are always looking for positive, hard-working team members. No application fee is required. Click here for available positions. Or, apply in person at any manufacturing facility. Q: Does Hauslife Furniture use mass email or direct mail to solicit employment? We send emails, postcards and other forms of direct mail to announce employment opportunities within the companies. Applications are accepted in person at any manufacturing facility. Click here for available positions. Q: Is Hauslife Furniture listed on the NY Stock Exchange? Can I buy stock? Hauslife Furniture is a privately-held, American-owned company. Therefore, it is not traded publicly. Q: Have you received a suspicious email about Hauslife Furniture? has informed the Better Business Bureau that the Hauslife Furniture name is being used on the Internet by someone not associated with Hauslife Furniture, to perpetrate work-at-home and counterfeit check scams. Between November 2007 and August 2008, the company has received almost 8,000 inquiries from consumers who have received bogus email messages from scammers pretending to represent Hauslife Furniture. Generally, the scam email message informs consumers of a fictitious work-at-home position as an accounts receivable employee. Consumers who responded to the scam were sent counterfeit checks by the scammers, were instructed to deposit the counterfeit checks into their personal accounts, to deduct a commission, and to wire the remainder to someone representing themselves to be a Hauslife Furniture. Industries has posted an email scam reporting system with tips to avoid becoming a victim on its commercial website. Please take a moment to review the reporting system. Q: Who can answer my warranty question? If a problem should arise which you feel is covered by our Limited Warranties, contact the retailer from whom you purchased your furniture, to obtain warranty service. All claims must include the original bill of sale, the product serial number, and be filed within the applicable warranty period. reserves the right to require defective parts be returned upon request. You must make arrangements with the retailer to schedule the transportation of the furniture or parts from your home to the retailer or from the retailer to your home. If the retailer from which you purchased the furniture has closed and you need service, contact in writing or call our Customer Care. Customer Service Phone Number: 800-477-2222. Call: 866-436-3393 Monday­­–Friday, 7 a.m. to 7 p.m. & Saturday, 7 a.m. to 5:30 p.m. (CT).